From last winter, this is a view from Lighthouse Point in Deception Pass State Park. The Deception Pass Bridge is in the background. The Fidalgo headlands here are built of dunite stone revealing the island's volcanic origins. Winter is the best time to visit the park in my opinion. The air is the clearest for photos and the park is not crawling with tourists. The temperature on that afternoon in February hovered around 50° F (10° C). Despite the name, there is no lighthouse here in the classic sense. It is a small, mechanized device, more like a ship light, located on one of the outcrops. Most things on the beach come in shades of gray and other earth tones. In such a setting, something glowing purple catches your eye. These are the empty shells of the Varnish Clam (Nuttallia obscurata), a recent immigrant from Asia. The outside of the shell is nondescript and can be seen at the larger shell's 10 o'clock position. It does look as if it has been varnished. They are thought to have been first introduced into the Strait of Georgia near Vancouver, B.C. in the late 1980's. The dumping of ballast water by Asian transport ships is the probable source. These empty shells were spotted near Similk Bay. They are the likely victims of predation by Dungeness Crabs. These are Columbian Black-tailed Deer (Odocoileus hemionus columbianus), no doubt stopping by to prune my Rugosas. I believe this pair is brother and sister born two years ago. When I see does with fawns, there are usually two youngsters. The pairs will continue to hang out together for a couple of years. Notice the antler buds sprouting from the gentleman on the right. When I purchased this property, a trail led from the road to the beach. It turned out to be a deer trail. After 23 years, the deer continue to follow the exact route of that trail. This pair is right on track and probably headed to the beach for a little salt. 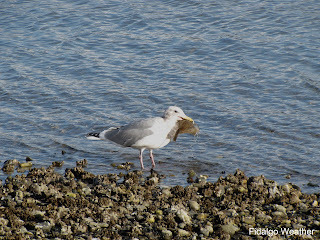 On a beach hike last winter I came upon this gull struggling with his catch. It was obviously a case of eyes bigger than stomach. I believe he was a Glaucous-winged Gull, Larus glausescens, in his winter plumage. He could also have been a Western Gull (Larus occidentalis) or even a hybrid of the two. Did you know there are city gulls and country gulls? In the town where I grew up we had city gulls. They were noisy, aggressive, quarrelsome and frequently seen hanging out at dumpsters. Back in the 1970's when "Jonathan Livingston Seagull" was the hot book, I never understood the appeal. Where I live now we have country gulls, quiet and peaceable. They will fly straight up into the air with a mussel and drop it onto the beach rocks to crack it open. It's almost the only noise I ever hear them make. Does that qualify as using tools? I often find things in the yard related to the local wildlife, including crab legs and fish parts. This morning I found this nest in the driveway. It is evidence of another generation of young birds joining the local wildlife community. I am guessing it was built by a sparrow, but the builder may have been a bit larger bird. Whoever made this beautiful structure was an amazing architect. It was well constructed of grass, twigs, leafy plants and some jute twine I recognized. I am pleased to have provided building materials for this endeavor. Low rainfall, poor soil and shade can be special problems for gardeners. Finding plants that will tolerate all three can be a challenge. 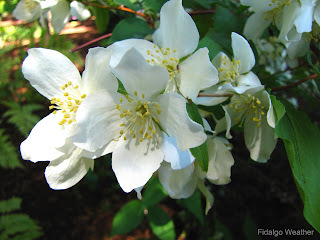 One great solution for Pacific Northwest gardens is Wild Mock Orange (Philadelphus lewisii), the state flower of Idaho. Not only is it native to the region, it is also a link to our history. It was first described and named by Meriwether Lewis of the Lewis and Clark Expedition. The variety 'Blizzard' is smaller and more upright than the wild species. It grows to about 5 feet (1.5 m) tall and wide. 'Jedo Jima' is the name of this variety of Japanese Iris (Iris ensata). This one is growing in a pot partially submerged in a pond, which it seems to like. Many Irises enjoy slightly boggy conditions. It was planted last year, and this is the first time I have seen it bloom. I am not disappointed. Visitors to Deception Pass State Park, Washington are always impressed by the old-growth forests, bays, beaches, islands, headlands and, of course, the bridge. These features provide some great views and photo ops. A visitor may also notice intriguing little close-ups. A collage is a composition of small objects pasted together for their symbolic or suggestive effect. The attentive hiker along the trails at Bowman Bay will discover collages created by nature. The elements here include plants, stone, lichens, bark, moss and plant litter. Our native Vine Maples (Acer circinatum) can produce a spectacular color display in the fall. These are very nice small scale trees for the naturalized or woodland landscape. They fill the same garden niche as Japanese Maples or Full Moon Maples. In full shade, they will take on their "viney" nature. In the sun, they will become symmetrical trees or shrubs, depending on how they are pruned. Young spring leaves appearing on new growth give us a hint to what is in store for the fall. We are told that the reds, oranges and yellows are the true colors of deciduous leaves. These colors are masked by chlorophyll which the tree quits producing as fall arrives. As they mature in a few days, and chlorophyll production kicks in, these new leaves will become a velvety apple green color. Even spring can bring blustery days and whitecaps around here. This is the result when Pacific lows move inland north of us. Such a day provided the opportunity to experiment with Canon’s “PhotoStitch” software. I also used the “Stitch-Assist” camera setting. Try saying “Stitch-Assist” three times fast. This photo is a blending of four images taken from a single position on South Fidalgo Island. It turned out surprisingly well, although the beach has assumed an odd boomerang shape. The islands in the distance also look farther away than they really are. The islands in the background from left are Fidalgo extending halfway across the background; closer are Kiket in two parts connected by a tombolo, Skagit, Hope (behind Skagit and the taller fir) and Whidbey on the right. Our hearts are broken by the catastrophe in the Gulf and our rage is unbounded. This nation is under assault by a vile and grossly incompetent cabal of corporations, BP, Halliburton and Transocean. BP has a history of outrageous behavior. It was formerly the Anglo-Iranian Oil Company. In cahoots with the CIA in 1953, it orchestrated the overthrow of the democratically elected Prime Minister of Iran, Mohammed Mossadeq, to protect its oil interests. This set in motion a chain of events that bring us to the situation we find ourselves today in the Middle East. Do not allow the corporate news media, in league with BP and their advertising dollars, to rebrand this event the “Gulf Oil Spill.” It is the BP Oil Spill, or if you prefer, the BP/Halliburton/Transocean Oil Spill.